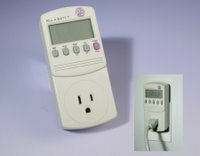 Kill-a-Watt Meter - Appliances using too much energy?- CLICK HERE! Kill A Watt meter helps you determine how much energy your appliances are using. Track total power consumption by hour, day, week, month, or year. Also displays Voltage (V), Line Frequency (Hz), and Power Factor (PF). 15 amp maximum. No batteries required. Accepts standard 110 volt plugs, 2 or 3 prong. The Kill-A-Watt allows you to connect your appliances and assess how efficient they are. A large LCD display counts consumption by the Kilowatt-hour, just like utility companies. You can figure out your electrical expenses by the hour, day, week, month, even an entire year. Monitor the quality of your power by displaying Voltage, Line Frequency, and Power Factor. The cost of electricity can really hit you where it hurts. Now with Kill A Watt you can reduce your energy costs by identifying the real energy abusers. Simply plug your appliance into Kill A Watt and assess how efficient it really is. The jumbo LCD display measures consumption by the kilowatt-hour, just like your local utility company, so you can quickly calculate costs. It's perfect for seeing how much juice that freezer in the garage is sucking up, or to see how much it costs to keep your computer on throughout the day. Universal dishwasher motor and pump kit- CLICK HERE! Before taking apart your dishwasher, always keep in mind safety first. Before working on your dishwasher, unplug the appliance from its electrical receptacle or shut off the circuit that powers it. Turn off the hot water supply valve beneath the sink before disconnecting or working on the dishwasher’s supply valve or hose. Don’t work inside the dishwasher immediately following a wash cycle; various parts, especially the electric dryer element at the bottom, may still be hot. New and improved dishwasher pump and motor kit. Replaces all previous versions. Fits GE-made dishwashers including GE, Hotpoint, Magic Chef (GE design), RCA and Kenmore (model prefix 363). Complete pre-assembled kit. This kit may not look like your old pump/motor assembly. Recently redesigned by GE, it replaces all previous versions since 1970. Complete instructions are included.